﻿ Leopard Dinnerware Set, 16 Pc. 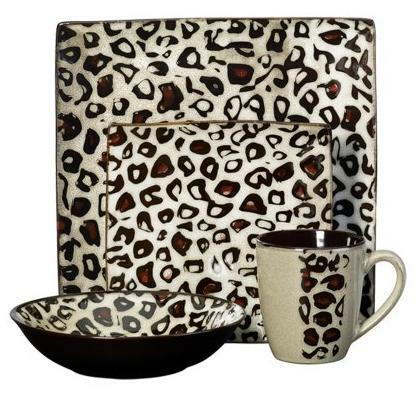 Animal Print Essentials › Products › Leopard Dinnerware Set, 16 Pc. Leopard Dinnerware Set, 16 Pc. Raw and refined, sleek and sophisticated, Gourmet Basics Leopard dinnerware makes a fashion statement on your dining table. A stunning leopard print gives this stoneware collection wild appeal. 16 Piece Set, service for 4, includes four each: 10 3/4″ dia. dinner plate, 7 3/4″ dia. salad plate, 8 1/4″ dia. soup bowl & 12 oz. mug. Microwave & dishwasher safe. Separate pieces available. For details, click “Buy Now”.